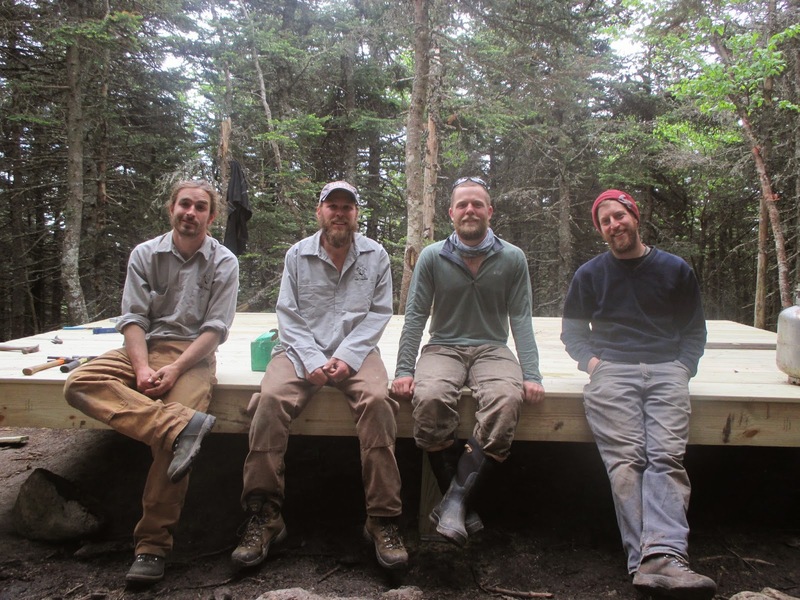 AMC Trails Blog: New tent platforms for Nauman! New tent platforms for Nauman! How many of you have been to Mizpah Hut? How many of you knew that there was a tentsite that can fit 40 people in the immediate vicinity? For those of you who already knew, yes that tentsite is Nauman tentsite. Nauman is the fourth-busiest site in the AMC White Mountain campsite fleet, located at the edge of the Dry River Wilderness. It is best described as a string of platforms amidst green moss and spruce-fir. It is also described as ‘that site next to Mizpah.’ It is the only AMC campsite in the Presidential Range (Hermit Lake shelters are a different entity and indeed a different kind of structure), and is often a starting point (or ending point) for groups traversing the Range. Nauman got a little facelift recently with the replacement of two double platforms. The two platforms we replaced were a minimum of 25 years old, and partially constructed with creosote-treated lumber. One of them was relying on the decking for structural integrity, which is the reasons why we requested capital funding through AMC to replace the platforms this year. 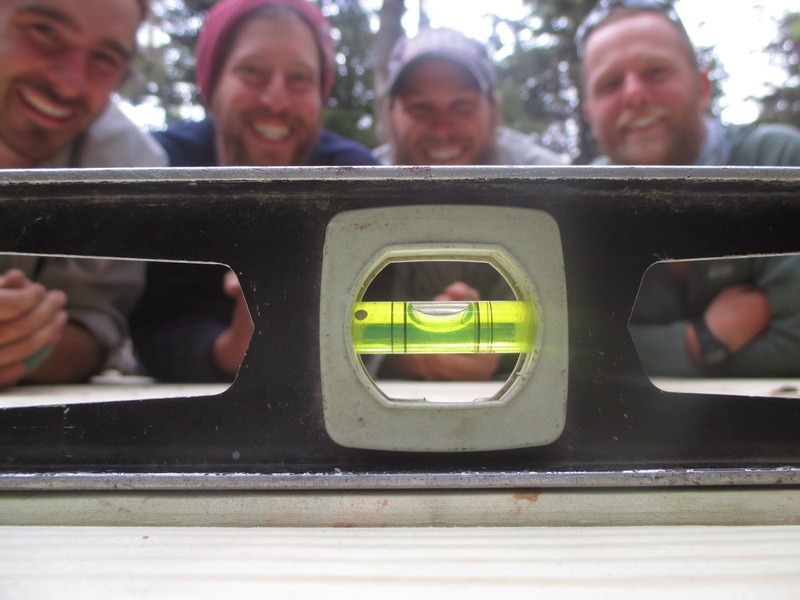 Of course the simple act of replacing a platform is, well, not so simple once the project is happening in the boreal forest and in the backcountry. It involves pre-cutting all lumber to length in April so it can be airlifted in May. It involves the labor time of three to four staff working as a crew. It involves hiking in a generator and rock drill, as well as the heavy hardware this project manager forgot to airlift in (don’t worry, I was the one who hiked the dozen base plates in, and I will never forget to airlift the base plates again). It involves careful measuring and squaring and leveling. It also involves weather that varied from cold, to clear, to cold, to unbearably hot. The attention to detail meant that the crew did not have to leave the woods to pick up any forgotten supplies, and also that the only waste produced was the old lumber from the old platforms. Some of that old lumber will be re-used by the caretaker to repair their home-made furniture, and the rest will be airlifted out in the fall. The second platform replaced. Downed branches were only there temporarily! It took roughly two days per platform to deconstruct, set the foundation, and then finish the framing. And at the end, the caretaker eagerly welcomed the first visitors to christen the new platform, and eagerly bid goodbye to the creosote sills.